Travel is something I vowed to do more of in 2014. When my friend Lori suggested we take a trip to New York for Fashion Week, I of course jumped right on it. Of course, it’s real winter in New York and being prepared for the cold is going to be difficult. It’s been several years since I was in New York last, but that trip was also very cold and I was so very unprepared. 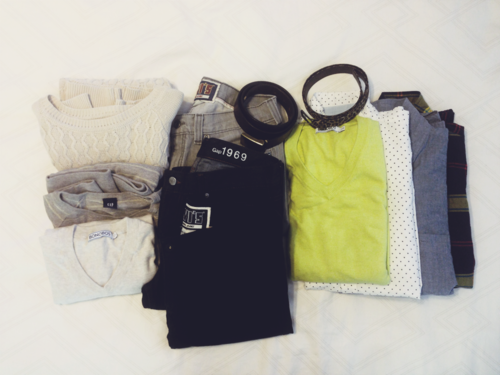 This time, I’m packing plenty of sweaters and making sure each outfit has multiple layers. Since Austin doesn’t really have a winter, I actually don’t own many winter clothes. Layering is really all I can do. Here’s a snapshot of what I’m packing so far. Everything I pack needs to work double duty. I’ve put together a color palette of cream neutrals and a few bright colored things here and there. I’m trying to put a bit more of an urban edge in my look with black and gray skinny jeans and bulky sweaters. I’ll also add some nice detailing with a leopard print belt and some jewelery. Hopefully, my outfits will be exciting and functional in the urban tundra. I can’t wait to share pics from the trip! Follow me on Instagram for more!